On paper, “The Miserable Mill: Part One” should work. And while it’s been a few years since I read the source novel, I’m fairly certain it did work. At the very least, the original Miserable Mill was the first book in the series to break some of the patterns that the previous two had followed so lavishly, offering a breath of fresh air to a format that desperately needed to breathe. 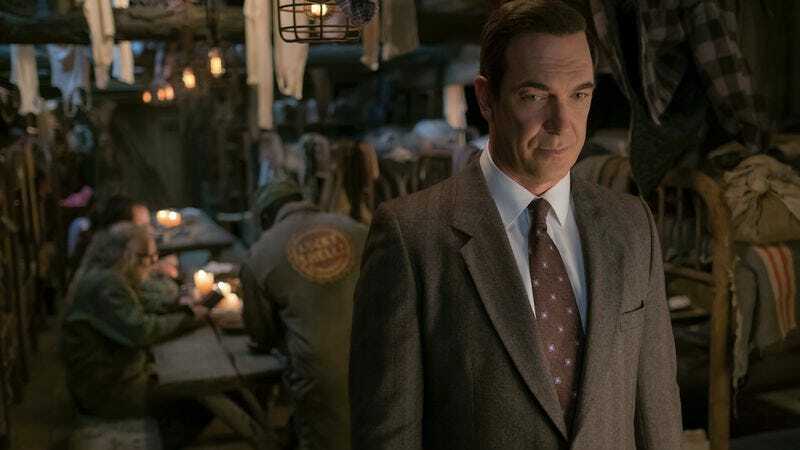 But the penultimate episode of Lemony Snicket’s A Series Of Unfortunate Events is the weakest the show has produced yet, squandering opportunities for tension or emotional weight in the service of unnecessary scenes and misguided character development. On that last: I’ve been skeptical of the show’s efforts to “get to know” Count Olaf in the past, but the scenes that focus on him here are actively ruinous, turning what should be a menacing, dour figure of impending doom into a still dangerous but kind of charmingly goofy villain. Neil Patrick Harris is a charismatic and talented performer, but that charisma is starting to work against him. It’s understandable that the series would want to give its leading man more screen time, but the choice undermines the main faction at every turn. Start with the most obvious mistake—the episode begins with the children running off on their own (which is smart), but then confirms fairly soon after that Olaf has managed to track them. This is a dumb move. Yes, the scene of Olaf chatting with the truck driver (his name is Evander) is funny enough, but by immediately confirming that Olaf is on his way, the story loses one of its most effective potential hooks. We know Olaf will show up, of course, but seeing him so soon out of disguise and making us privy to his plans makes him less threatening. It also means the reveal of him in drag at the end falls flat. It’s not even a very good sight gag. This flaw isn’t just with Olaf, either. For this storyline to be effective, the Lucky Smells Lumbermill should be an oppressive nightmare; the kids are on their own even more so than usual, and that should imply a rising sense of danger and claustrophobia. And you can see pieces of that in the script. Sir (Don Johnson), the mill owner, puts them to work as adults, in an exhausting and dangerous job. Mill employees are paid in useless coupons instead of money, and all they get to eat on their five minute lunch break is a wad of gum. Klaus and Violet keep struggling for answers and not getting any, and the local optometrist, Dr. Georgina Orwell (Catherine O’Hara, terrific), is even less trustworthy than your average optimist. All of these concepts should add up to something menacing, but the threat never coheres into anything compelling. Johnson is blustery and dismissive but too nice as Sir. His relationship with Charlie (Rhys Darby, delightful as ever) is fun, but, as with Olaf, the more time we spend with them, the more they seem like people, which works against their effectiveness as threats. A stronger adaptation would’ve made the Baudelaires’ plight feel more, well, plight-like. As it is, nothing here actually feels all that serious, not even when Klaus falls under Dr. Orwell’s spell. It’s more an irritation than anything else. Oh, here’s some more nonsense we’ll have to deal with. The biggest twist of the episode is one that most viewers probably caught onto ages ago. The reveal that Mother and Father aren’t actually the Baudelaires’ parents (who are dead) should be a painful discovery, the final “this is as bad as it gets” moment that proves once and for all that the children are on their own. And to be fair, there’s something sad in watching the wrong Mother and Father embracing their own children (who we earlier saw getting blueberry pancakes, the lucky twerps), promising to tell them the truth about everything. This, of course, is how it should’ve been for Violet, Klaus, and Sunny, who are brave and kind and oh-so-deserving. If only their own parents had taken certain steps before it was too late. So in concept, this isn’t a bad twist. But I’m not sure it works well enough to justify all the time spent building up to it. Apart from rubbing salt in still-open wounds, there’s no narrative reason for Mother and Father to be in the story at all. That could change in the final episode of the season, but for right now, the whole thing plays out like a mean-spirited joke. And while mean-spirited jokes aren’t entirely out of place for a series like this one, a mean-spirited joke that takes seven episodes to tell has to have more behind it than the obvious. It’s also a distraction from what really ought to be the episode’s main hook. The Baudelaires arrive at the mill and learn, to their horror, that their parents have been blamed for the destruction of the nearby town of Paltryville. For once, Klaus and Violet’s interest in what’s going on in the background has an immediate connection to their own lives, and while it’s fairly clear that the Baudelaire parents weren’t actually guilty of the crime (as a quick freeze frame on the one uncensored copy of the history of Lucky Smells Lumbermill shows), this still offers a chance to get at what must be some complicated feelings the kids have for their dead mom and dad. The closest we get to this is a brief break between Klaus and Violet: Klaus is ready to go, but Violet wants to clear the family name. Up until this point, the two have operated in perfect harmony, and having an argument about what to do next—especially when they’re finally utterly on their own—is a smart development. But it happens so quickly that it barely registers. Klaus falling under Dr. Orwell’s sway is creepy, but it’s hard to ignore the feeling that it could have, should have been creepier. 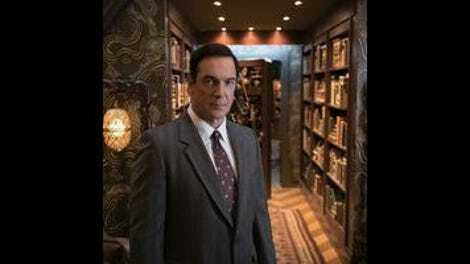 What’s really at the heart of the episode’s flaws is the same issue the show has been struggling with all season: trying to find a good mix of following the Baudelaires and building up the mythology around them. Every episode has spent at least a little time at clues and insinuations and nods toward a history that is still far from clear, and the effort has had varying degrees of success. Overall, though, I’d say this is a balance that author Daniel Handler and the rest of the show’s creative team have never managed to strike. In becoming infatuated with their own cleverness, they’ve become nearly as bad as every other adult in the Baudelaires’ miserable lives. The downside is we all have to suffer for it. Mr. Poe spends most of this one on the sidelines. He freaks out in the opening scene until he’s distracted by some delicious free chowder; then he calls the lumbermill late in the episode, and accomplishes nothing. Rhys Darby is yet another in a long line of well-meaning adults whose refusal to take a stand on anything lays waste to their good intentions. “In this economy, children are lucky to have a job at all.” -Sir. “Every time we’re about to get some answers. Seriously?” -Klaus, getting frustrated. I’ve heard others mention this, and I have to agree: Sometimes the special effects for Sunny really don’t work. Another misstep: the ambiguity about the new foreman at the mill is completely lost if we already know Olaf is in the area. Yes, anyone familiar with the series at this point would realize the foreman is probably one of Olaf’s henchpeople in disguise. But by showing Olaf arrive the night before, the show gives us information the Baudelaires don’t have, and then forces us to wait while they catch up. “In every library there is a single book that can answer that question that burns like a fire in the mind.” -quote written by Bertrand Baudelaire in the Lucky Smells lumbermill dictionary. Nice nod to The Great Gatsby, Klaus. As mentioned, O’Hara is swell, and the eye exam montage is nicely bizarre. VFD!